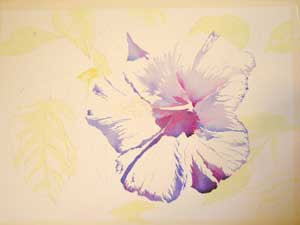 Continuing on with the Hibiscus Lesson that I have been posting. 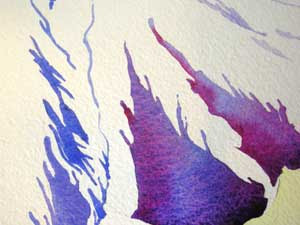 Now I have mixed a puddle of Quinicridone Magenta and Ultramarine Violet. I used varying mixtures of these two colors back and forth and I used my Number 10 Round brush to paint in the first wash of the flower head. 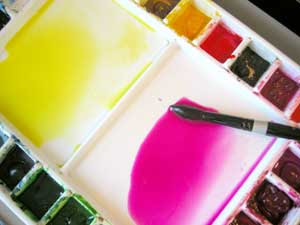 The wetter, more magenta washes were used to create the softer, higher value tones. The more violet mixture was used to create the shadowed areas. To develop the darker detailed areas, I added some French Ultramarine blue. I held my brush straight up and down and barely touched the tip of the brush to the paper, so that as I pulled the pigment along, it would create lovely, delicate linework.